Wow, great post. Very interesting stuff. I really like how you don't us magic in the series. It's over used as it is, and only a few people really know how to use it well in their stories. Mouse Guard wouldn't seem as gritty, epic, and real if the little mice were running around casting fireballs at wolves and all that. Any, i loved the quick video. It was incredible; i'm always amazed by people with your talent for drawing stuff that looks so cool in a matter of seconds. Can't wait to see how you explore things like the bee keeper and spider silk and stuff. If you did short stories down the road on that kinda stuff i would love it. But for now, the big epic arcs are perfect. I can't think of any questions right now, but when i do i'll sure get back to you. What other properties would you like to work on (besides Hellboy)? 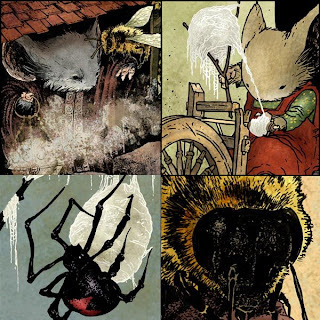 Or transversely, which artist(s) would you like to see do a Mouseguard story? I like the fact that you have no magic in your world. 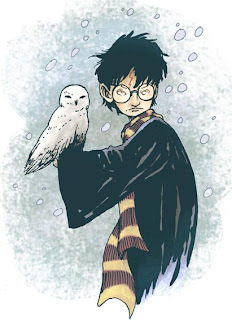 Magic is used too much as a "deus ex machina" and tends to cheepen the story. I hadn't collected a comic book for years until I saw Fall 1152 in a book store. 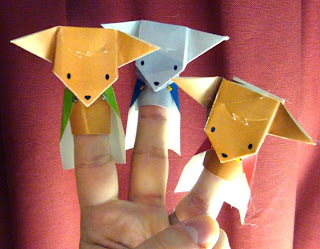 In your post, you included sketches of the mice from 1996. 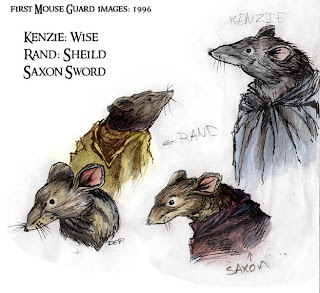 Can you describe what led to the changes in their look since then, and maybe even the look of Mouseguard itself? I love the video of you drawing Lieam, and I'm excited that the Fall black and white is finally going to be released! I'm going to have to double check with my local comic shop that they still have me down for one. I have to say that an annual or some type of bonus issue of Mouse Guard, maybe telling a number of small stories, would be awesome! 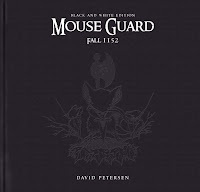 I have the misfortune of being a huge Mouse Guard fan but not having been able to acquire any of your sketchbooks. I hope future sketchbooks will be made more available, if you did a larger print run you could sell them through your website and I'm sure you'd have huge success. As well, is there a future possibility of a nice, large hardcover Art of Mouse Guard book collecting your earlier sketchbooks, convention sketches (many seen on this blog), development sketches and other Mouse Guard artwork and materials? I do not want to sound like too much of a "fan"atic, but OH MY GOD! Thank you so much for replying to my question. The pic of you drawing Lieam...well it means a lot to me. Again, Thank you. Hi David! Thanks for that awesome post. It's very kind of you to take some time to answer a few questions. I loved seeing that video of you sketching. Great stuff. 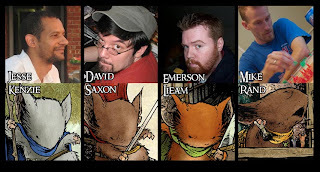 With so many movies based on comic books these days, do you foresee a Mouseguard movie sometime in the future? I think the CGI format would be the perfect way to showcase the world you've created. Thanks, and best of luck with everything!